simple.. but still my favorite! so... in order to "nest" them like we did last week..
you'll need to press 3 in the other direction..
you'll be able to "nest" your seams together to match points. put two triangles together and sew a 1/4" seam. repeat to add one more triangle. and press this seam open. 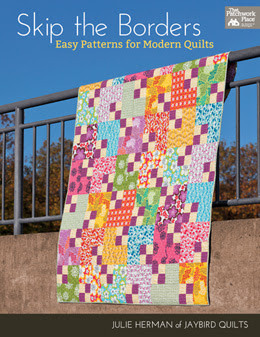 you have enough strip sets to sew 6 blocks. but i only made 5.
it's up to you how many you want. but 5 is a good number for now. and i wanted to clear a few things up. 1. there really are no rules! this whole thing is about having fun & learning new things. 2. blocks.... lots of people in the flickr pool have been coming up with more blocks... and making more than 5 each week... and that is ok.. but don't feel like you have to! everyone works at their own pace... and that is a-o-k with me! 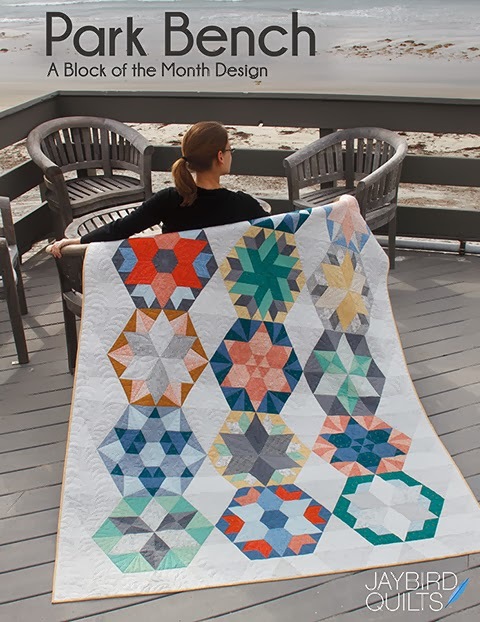 3. blocks.... i'll be teaching you at least 5 blocks.... but if you fall in love with one... it's ok to decide to make an entire quilt from that one block! 4. layouts.... similar to #2 lots of people in the flickr pool have been coming up with their own layouts.... this is also ok... but don't fret... or worry that you'll have to come up with your own layout... for those that want a step by step the entire way... i'll be providing that! 5. rulers.... as some of you have learned... just because it looks like a 60 degree ruler.. doesn't mean that it is one! make sure that if you are buying a ruler that isn't one that i listed.. that it is a 60 degree one..
i just wanted to put some things here that have come up a few times! I'm so happy to hear I wasn't the only one who used the wrong ruler for step one. Thanks for the second block! I was hoping we'd make some like these! Thanks Julie! 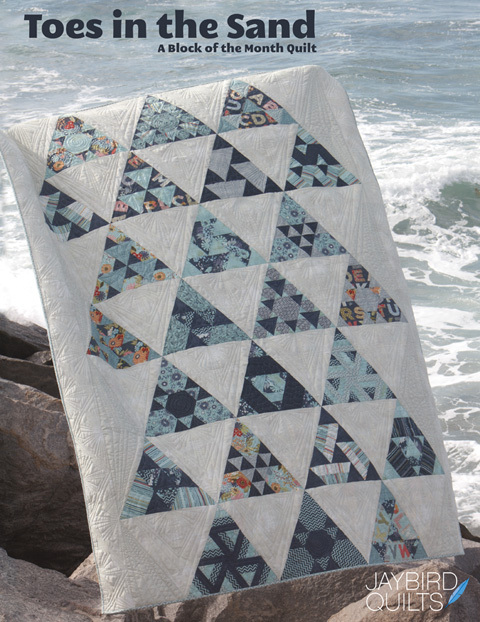 I think we're going to see some genuine beauties come out of this quiltalong and the pace is just right! 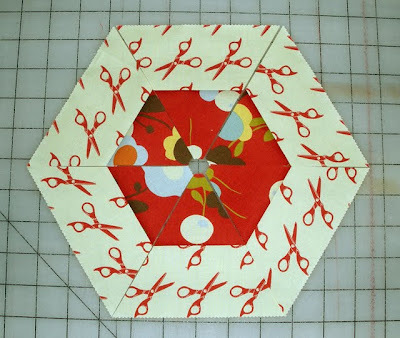 Now I'm wondering what I did wrong because I don't have enough pieces left to make this block. 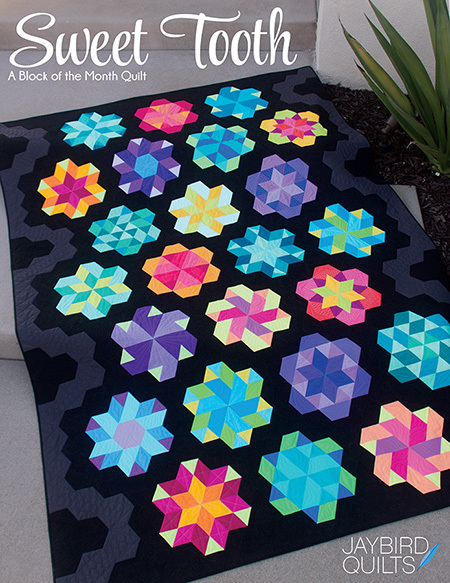 I only have 4 or 5 matching pieces left, after making the mixed blocks from last week. 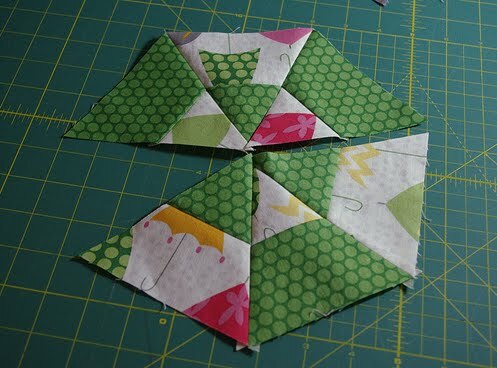 Stef, I think we're supposed to sew another 3 sets of strips together and then make these blocks. Thanks for more great instructions, Julie! 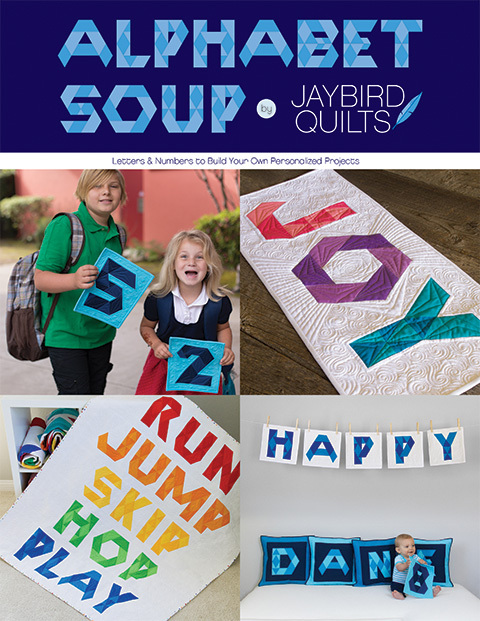 I was just upstairs playing with the layout for mine, which is way different, at least for now, from what you're having us do, but I'm having so much fun and can't wait to see what everyone comes up with! Oops! Did not read the directions completely! Thanks Susan! Good tips for if you haven't started yet, like me! 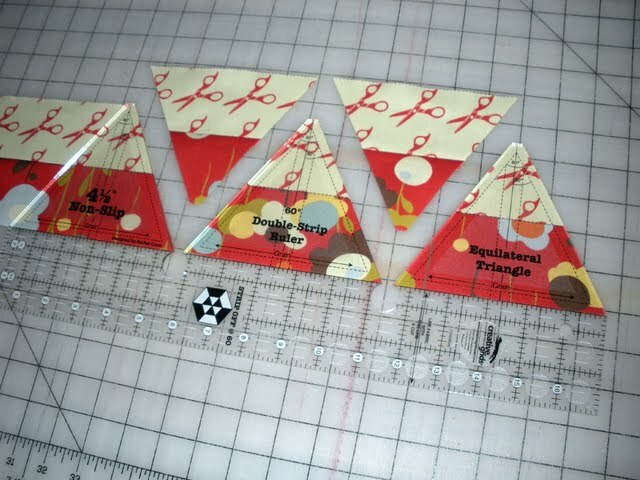 I've cut down all my wrong triangles so they are 60 degrees, added anoer strip of fabric to the bottom so they are 4.5", and now to assemble. 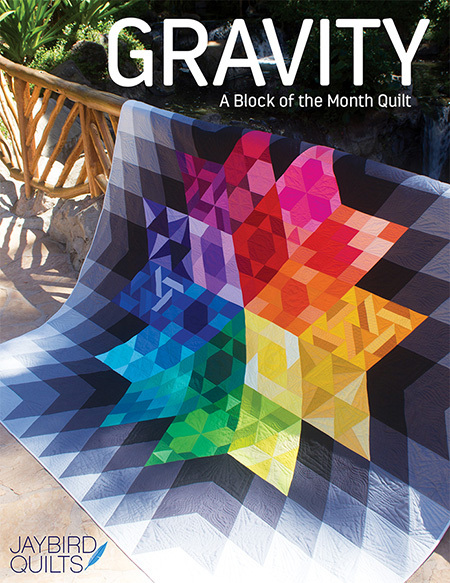 Then I need to make my week one blocks correctly, and then make my week two blocks. Nothing like falling behind in week one!! Crap. I just realized I don't follow directions very well. You said to choose 3 more sets of strips...I did 5 like last time..Doh! Good thing I like this block..LOL! 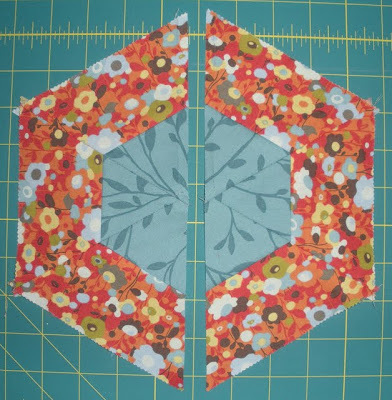 I'm so glad I wasn't the only on the had the wrong ruler... on the upside I had to buy fabric to do the do over strips... that was such a hard thing to do. :) I was SO thankful that my LQS had the line I was using. ANYWAY, I found that if you use a FQ for the larger prints it works out so much better on the finished block, rather than the jelly roll strip. 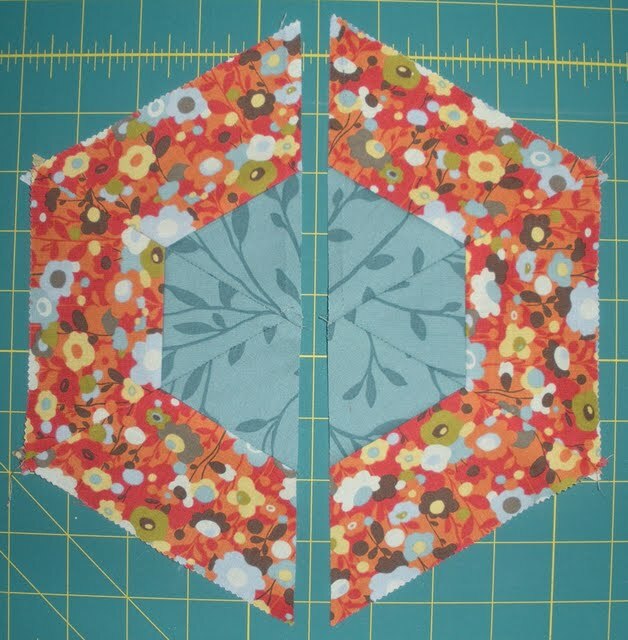 To the point (at least with the fabric I'm using) it's almost like I fussy cut them.